Of course I look serious! Matchstick rocket science is serious work! I'm pictured here doing some pre-launch trajectory calculations on my Keuffel & Esser sliderule. 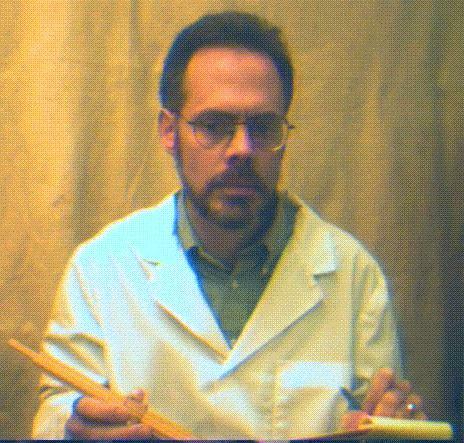 The lab coat is rented from a local costume shot especially for the Matchstick Rocket shoot-- no I don't look like this everyday ya dorks! It's a joke, a gimmick, OK? I've played with matchstick rockets since about age 12. I learned to make them by reading an article in an old issue of some science experimenter magazine. Never burnt the house down either. One minor event involving a few little ol' firetrucks, but no structural damage. Here's another picture of me, a bit more like real life. 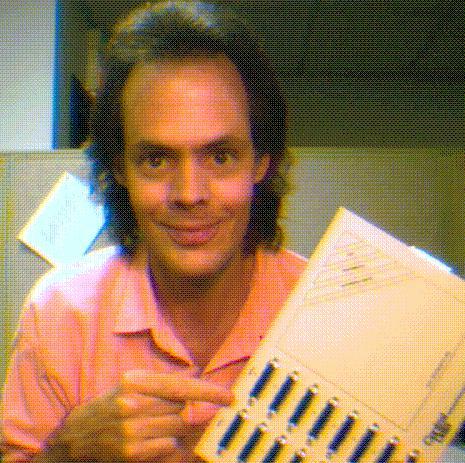 I'm holding one of those things I talked Central Data into making. Also check out my addictive Java game page NetCELL.